A question commonly asked by males who have gynecomastia is whether or not the condition can be successfully resolved with exercise. The answer to this inquiry often depends on a variety of different factors, the most important of which is the specific underlying cause of the enlarged breasts. If the development of overly large breasts is primarily caused by being overweight (a condition actually referred to as pseudogynecomastia), exercise may potentially prove to be an effective treatment option for many individuals. Pushups, butterflies, bench press, and various other workout techniques designed to target the chest can help reduce fat in the breasts while also strengthening the pectoral muscles. When combined with a healthy diet and regular aerobic activity (e.g. jogging, swimming, cycling, etc. ), these exercises can often help men achieve a more toned and masculine appearance in the chest, as there is no doubt that refining the pectoralis chest muscles can decrease some of the “fat” on the chest and help build up muscle. That said, when the appearance of abnormally large breasts is created by an accumulation of glandular tissue (which is the cause of “true” gynecomastia), exercise on its own will not be sufficient enough to fully resolve the issue. In these instances, directly excising tissue is generally the most effective option for the majority of men. Our Houston plastic surgeon – Dr. James F. Boynton – can accomplish this during male breast reduction surgery, which may involve some degree of fat reduction in addition to glandular tissue removal. For most patients, Dr. Boynton will extract fat with small cannula liposuction and then utilize a “pull-through” excision technique to remove redundant glandular tissue in tiny “strips” via the liposuction 3mm puncture incision. His specialized approach is far less invasive than traditional male breast reduction techniques, often resulting in reduced downtime while still yielding exceptional results. 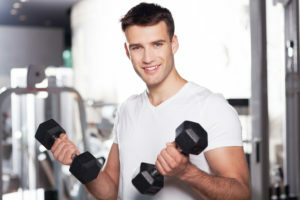 Ultimately, it is critical to note that while exercise and weight loss may generate a slight improvement for some men who are overweight, these efforts alone will usually not resolve the issue of enlarged male breasts completely. Consequently, male breast reduction surgery is regarded as the most effective and comprehensive treatment for the great majority of males with gynecomastia. To learn more about gynecomastia and male breast reduction surgery, please don’t hesitate to schedule a consultation with Dr. Boynton by contacting our practice today.